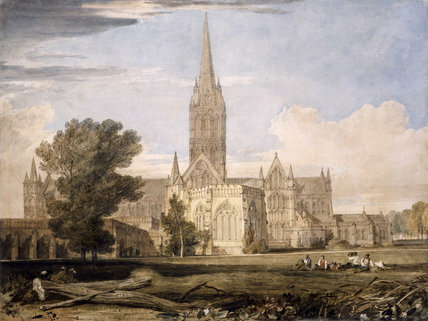 The set of views of Salisbury Cathedral executed between about 1795 and 1805 mark the summit of Turner's early achievement as a topographical draughtsman. They were commissioned by Sir richard Colt Hoare. Over a careful pencil outline, Turner captures the delicate architectural detail with qucik, broken strokes. The foreground is treated with much freedom, and shows liberal scratching of the paper to produce highlights. This was the second of the watercolours by Turner to enter the Birmingham collection.